With this C++ online test, you can easily assess the skills of prospective candidates before ever inviting them to an interview. The programming test is designed to appraise a candidate's C++ skills across a wide spectrum. This C++ quiz consists of 20 questions compiled by a team of experts in the C++ programming language and is guaranteed to provide an accurate picture of a programmer's abilities. Taking advantage of this practice test is a surefire way to easily and efficiently identify candidates with the highest aptitude for C++ programming. 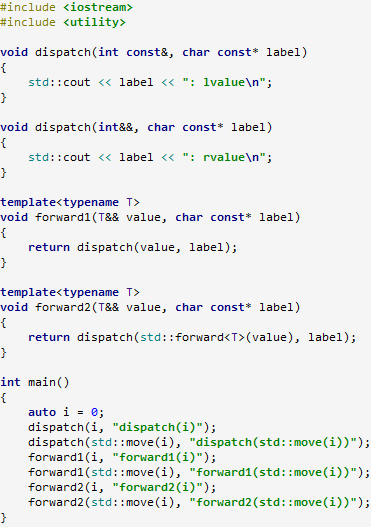 What is the output of the following C++ code? So, good news: you've got some promising candidates who've passed the online test and are ready for a live interview. Do you want to ask some programming questions personally? That's where our set of ready-made C++ interview questions and answers comes in. With our questions, assembled by a team of C++ experts, you'll be able to interview candidates like a pro and pick the best ones for the job! Be sure to read our blog article, 10 Proven C++ Programming Questions to Ask on Interview. 1. Are the same questions given to each candidate? Yes, but we feel this is absolutely necessary to ensure that the testing process is fair. By giving each candidate the same questions, we ensure that the difficulty of C++ quiz is the same for all the candidates. However candidates won't be given these questions and answers in the same order, so no one can cheat by memorizing answers in advance. 2. How should I read the results of the exam? This C++ programming test is not about finding great candidates. This test is about weeding out bad ones. Imagine you give this C++ test to a batch of five candidates and they come back with scores of 35, 45, 60, 65, and 80 out of 100. Half-right: what you should do instead is invite the three best candidates to an interview, i.e. the 60, the 65, and the 80. Keep in mind that your final hiring decision should depend on many factors. In addition to fundamental C++ skills and knowledge, you probably want to consider attributes such as overall professional experience and the ability to work as part of a dev team. In short, you simply can't judge whether a candidate is a good fit for your company based on skill test scores alone! We feel that the fairest way to administer our technical tests is to present questions in a multiple-choice format or quiz, rather than requiring test takers to write code. There may be many right ways to solve a C++ coding problem, but our questions ensure that the knowledge test scores are always objective. Further, it would be impractical for us to test every block of code submitted. 4. What is difficulty level of the test? We created our C++ exam mainly for screening mid-level developers, i.e. developers of average competence who are neither newbies to C++ programming nor masters. This isn't to say you can't use it to test junior developers, but you'll have to lower your acceptance score in order to accommodate for their lower skill level. Likewise, you can also use it to test senior developers if you want, but you should raise your acceptance score, since a more experienced developer should obviously be able to get more C++ questions right.